Lie on an exercise mat, keeping your back flat with no arching of the spine. 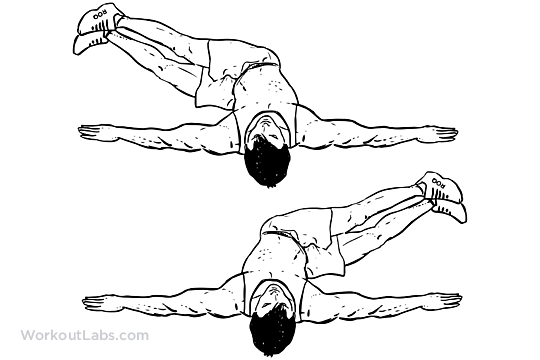 Extend your arms out beside you at shoulder level, with your palms pressed firmly to the floor. Your upper body should form a “T” shape. Raise your feet off the floor by bending your hips and knees to 90 degree angles. This is the start position. As you exhale, rotate both your thighs to one side until the outer thigh touches the ground or until you feel a stretch in your abs and lower back. Pause briefly, then rotate to the other side without pausing in the start position. When you have rotated to both sides, that is one repetition. Beginner: With the knees and hip bent as described above. Intermediate: Feet up with knees at 90 degrees but the hips remaining in a neutral position.